The festival takes place in Numata city. 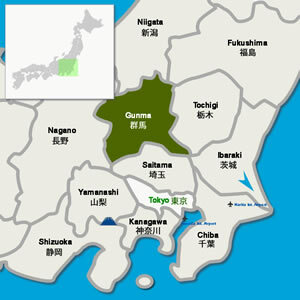 Gunma Prefecture. Numata city is on the way from central Tokyo to Minakami, a resort known for outdoor activities such as Rafting, Canyoning, and Skiing..
One of the headlights is Tengu Mikoshi, carrying large objects of Tengu, a long-nosed goblin, that only women are allowed to carry, somehow. The festival takes place in Numata city. From central Tokyo by train, Numata is on the way to Minakami, a resort known for outdoor activities such as Rafting, Canyoning and Skiing. You may need to change train at Takasaki to take the JR Joetsu-sen Line bound for Minakami. From Numata Station, it is a 15 min walk to the festival place.